ScopeMeter® 190M Series : All this power in your hand! The ScopeRecord memory stores 27,500 points per input or more, for high resolution recording of events up to 48 hours, and captures fast intermit-tents and glitches as short as 50 ns. This continuous roll mode stores, for example, events like motion profiles, UPS-, power supplyand motor start-ups. All models also have a ‘Stop-on-Trigger’ in the ScopeRecord mode. This allows the ScopeMeter to store waveform data until the instrument is triggered or until a repetitive trigger signal is interrupted. This way, the instrument will, for example, automatically recognize a power failure and store the waveform data preceding it. And with 100 x zoom, you can look at the smallest details, like individual power cycles. Two of these 27,500 point recordings can be stored for later analysis. The toughest faults to find are those that happen only once in a while: intermittents. They can be caused by bad connections, dust, dirt, corrosion or simply broken wiring or connectors. You may not be around to see it your Fluke ScopeMeter will. In this “paperless recorder” mode, you can plot the minimum and maximum peak values and average over time up to 22 days. The two inputs can plot any combination of voltage, current, temperature, frequency and phase with time and date stamp -to help lead you to the cause of those faults quickly. Add user text to individual ScopeMeter settings providing guidance to the operator when recalling a set-up. Waveform Compare store reference waveforms on the PC, or send a reference back to the ScopeMeter for waveform comparison and “Pass/Fail” testing. Analysis use cursors, perform spectrum analysis or export data to other analysis programs. 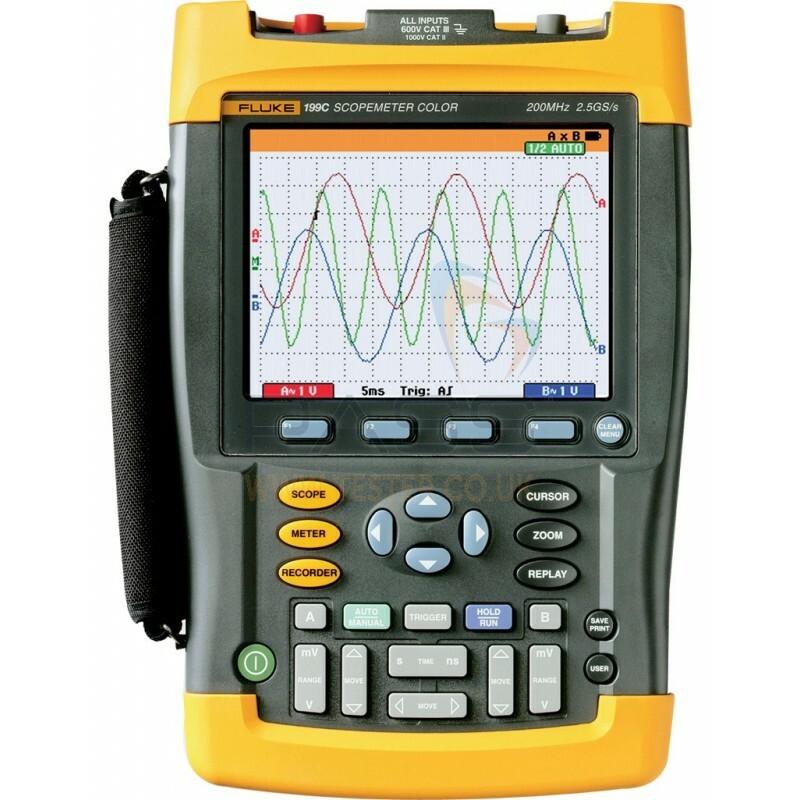 ScopeMeter test tools are connected to a PC via an optically-isolated RS-232 interface cable.